This post is Sponsored by Wholesome Surf Sweets. We love their allergy-friendly products and are thrilled to be sharing them with you. As always, all opinions are my own. Holiday gatherings are supposed to be about bringing people together, celebrating a special season, and creating memories with those you love around a table full of fabulous food. Although that last part sounds a little silly, it’s honestly the truth. Celebrations all revolve around food, but how do you do that in an age when food restrictions are so common? I have always loved hosting dinner parties and after my son’s food allergy diagnosis and my own personal switch to a plant-based diet, I learned how to accommodate a combination of dietary needs. Throwing a dinner party and balancing food allergies, special diets, and pleasing “picky eaters” may sound like a nightmare but I’ve learned to love it. To me, it’s a fun challenge, but far more importantly, it’s my way to give to those around me who are managing challenging circumstances. It allows them to relax and enjoy themselves without the worry of examining each dish. Even if you don’t have allergies yourself, as a host, you can follow these easy steps and make some simple changes to your menu so you can please everyone on your guest list. It may sound obvious, but it’s something that gets missed all the time. Ask your guests at the time of invitation if they have any allergies or food restrictions. That makes it clear right from the start that it’s important everyone feels included! You also need to ask because restrictions can change from what you may have already been aware of. It may be a family member who was recently diagnosed with a gluten sensitivity, or a niece who developed another allergy, or your brother recently went vegan. You just want to be prepared. To be honest, most of my time is spent creating a menu and planning the food. However, nothing says, “Welcome” like a beautifully set Easter table. Here are some clever and colorful ways to beautify your table without spending a lot of time or money. One simple way to quickly create a festive atmosphere is to add a flower arrangement. Grab fresh flowers from the grocery store or simply pull in an artificial piece you already own. I used my pink bouquet from our bedroom (which I purposely coordinated with the colors chosen). 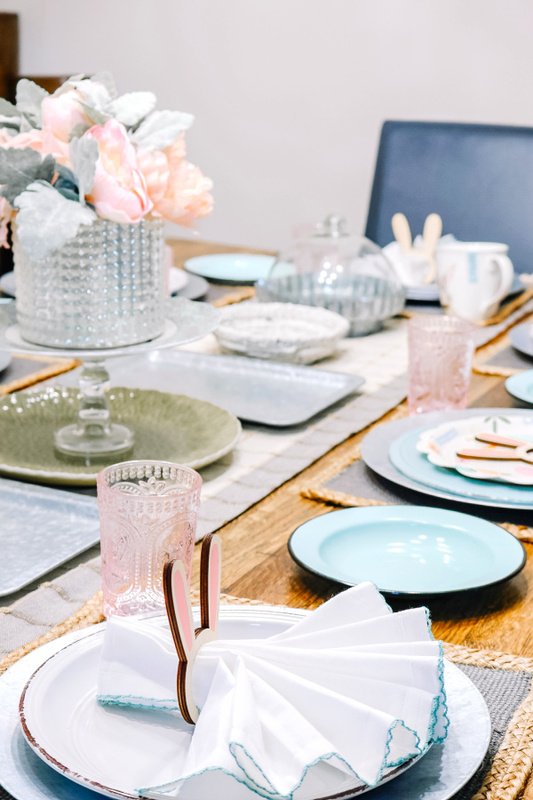 A palette of pastels work beautifully for an Easter table setting, so I opted for a blush-pink & sea foam blue theme and added elements of copper, fresh white, and light gray detail. Most of the pieces I already owned, but invested in some super cute pink bunny glasses. 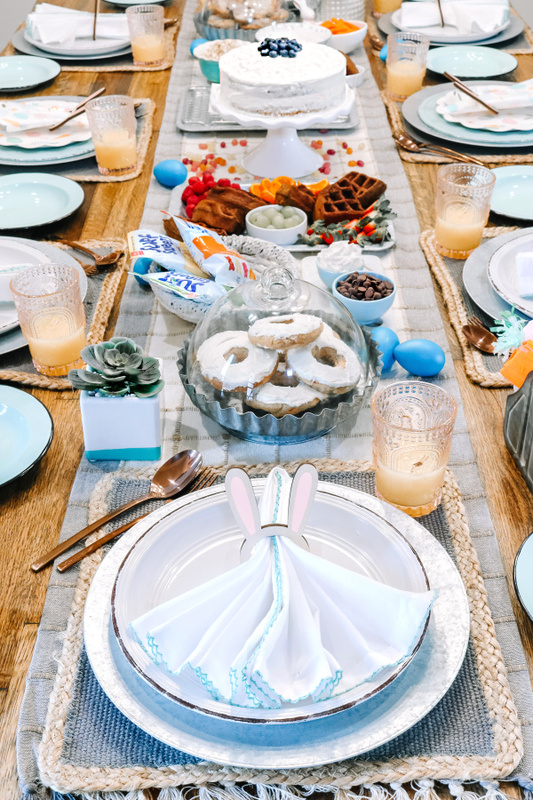 Create a festive and cheerful table by using playful bunny candy bowls, Easter-themed paper plates and napkins for the kids, and add some decorated eggs on your table runner. Sweets are decorative and delicious. 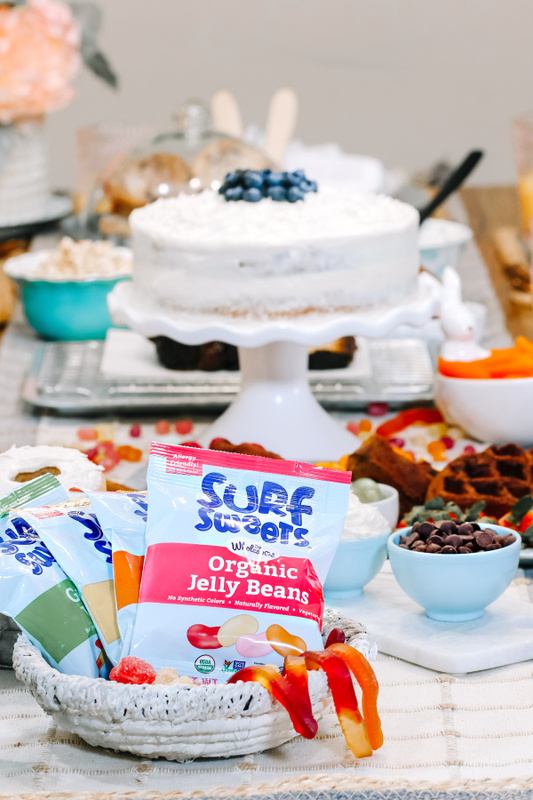 Wholesome makes a candy line called Surf Sweets (affiliate link) which includes vegan & gluten-free jelly beans, gummy bears, worms & more which will bring out the inner-child. 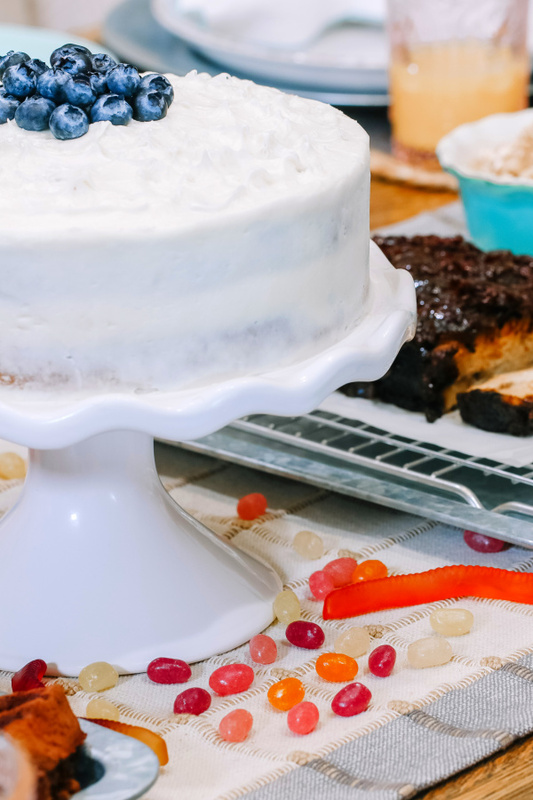 Sprinkle jelly beans around your cake centerpiece or create a few candy baskets for edible decor. 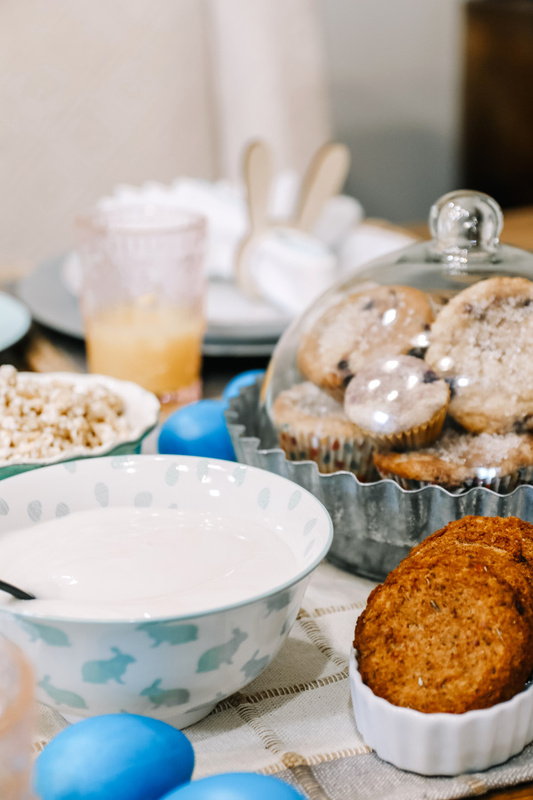 Now you know what restrictions you have to work with and you have some decor ideas in mind, you can start planning a menu for an Allergy-friendly Easter Brunch. You’ll need some crowd-pleasing ideas that will make everyone forget that it’s vegan or gluten-free. Luckily, there are tons of “free-from” brunch recipes on the Internet that will impress guests, whether you’re hosting or not. These vegan brunch ideas are perfect for Easter and spring weather, using some of the best flavors of the season. They just might become one of your new favorites! Isa Chandra is the genius who created this vegan-friendly take on a holiday classic. This sassy take on ham will definitely bring smiles to your guests’ faces, vegan or not. 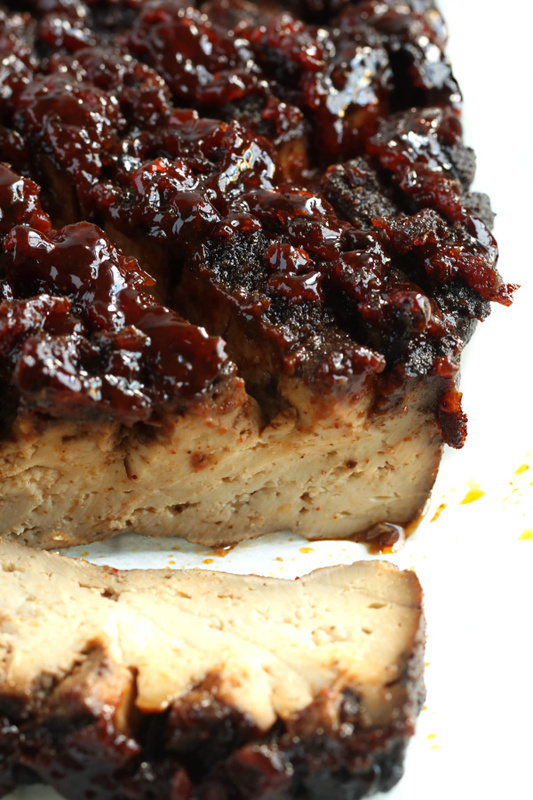 It’s sweet and smoky with notes of orange and maple and is loved by my entire family. It’s easy to double the recipe, or even triple, if this will be your main course. 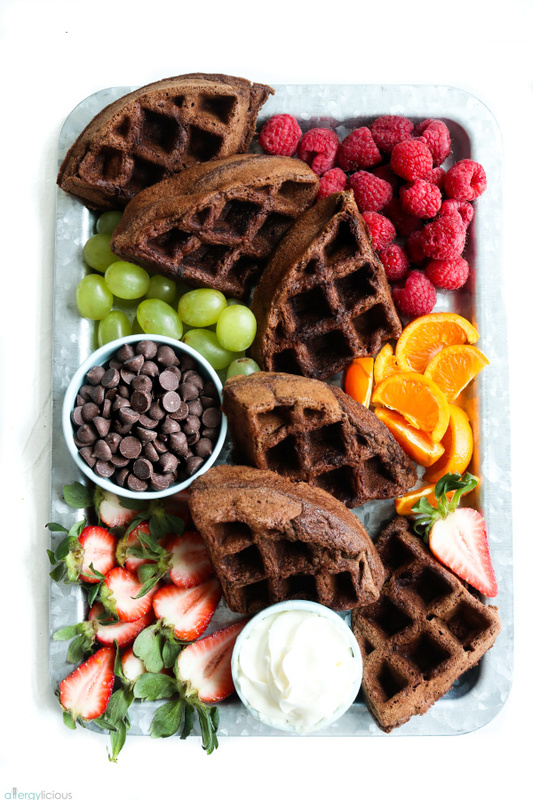 This vegan Chocolate Chip Waffle Recipe is easy and makes deliciously fluffy and decadent chocolate waffles! It’s free from eggs, dairy, soy, gluten, and nuts. Create a stunning brunch board with them and surround with vegan whip, fruit & berries, chocolate chips, and syrup. One must have carrots somewhere on the table during Easter. 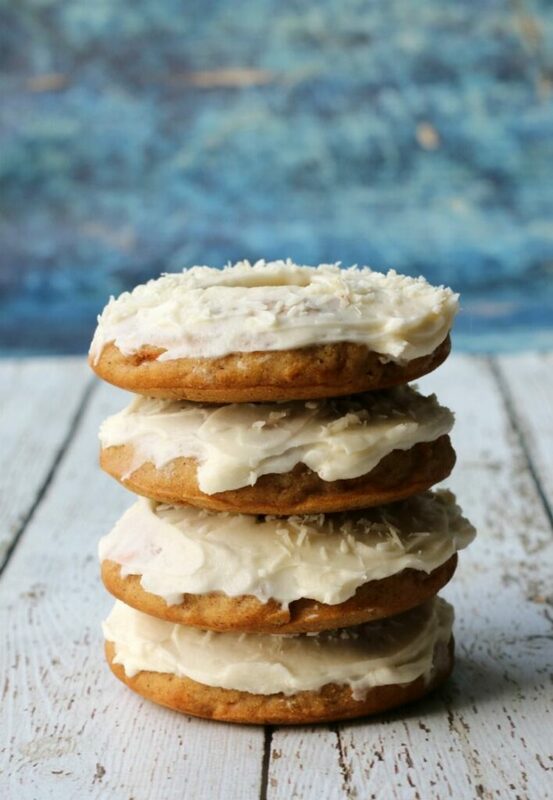 I usually make my carrot cake for dinner but for an early brunch, Carrot Cake Donuts take the spotlight. 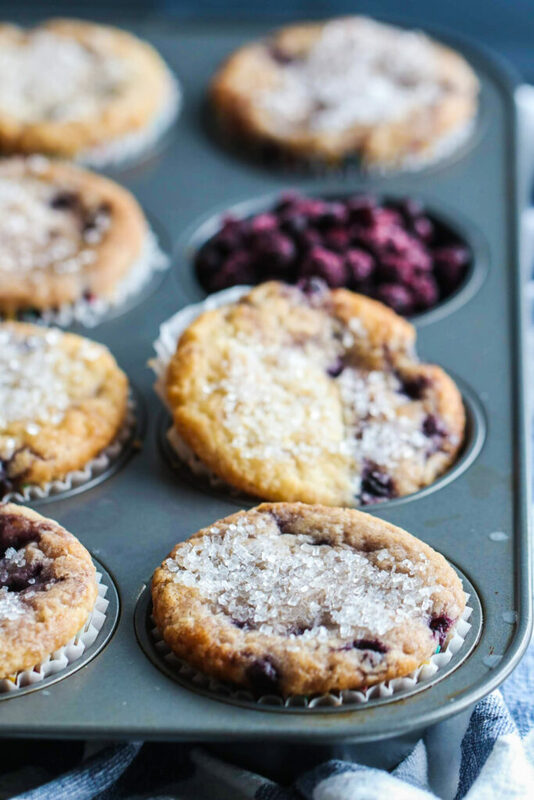 These Best Ever Vegan Blueberry Muffins have it all! 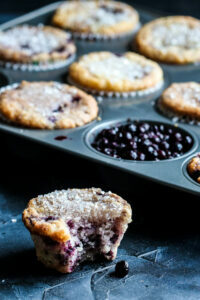 Sweet juicy blueberries, a sparkling sugar topping, and the most delicious tender crumb! 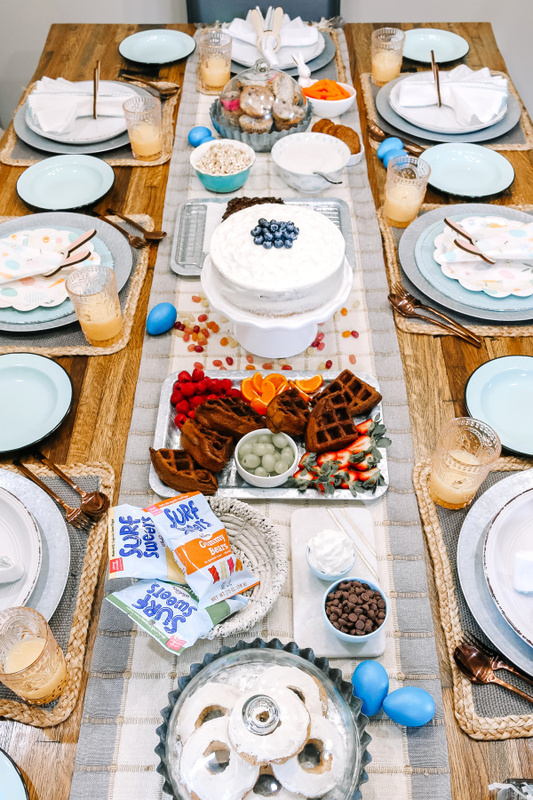 It may sound silly to have cake for brunch, but we’re making this Allergy friendly Easter the best one yet! 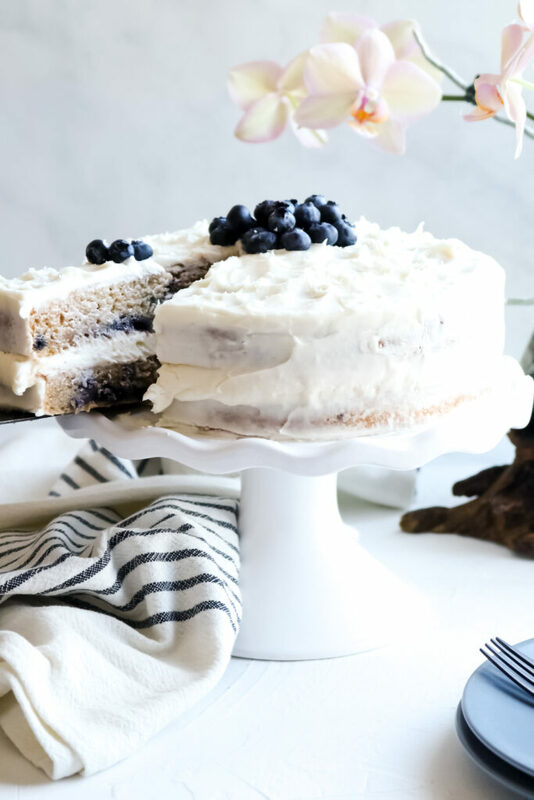 This Blueberry Banana Cake recipe is amazing and your guests won’t believe that it’s vegan, gluten-free and nut-free too! It’s so soft, easy to make and perfectly sweet! Pair with tangy vegan cream cheese frosting and fresh blueberries for a delicious Easter treat. To balance out the sweets, incorporate a little dairy-free yogurt, allergy-friendly granola and one of my favs, vegan breakfast sausage to the menu. Don’t forget that people usually like to help. If someone offers, feel free to give them a few safe ideas they can bring. It could be a veggie platter (without the ranch), fresh fruit, a sparkling drink for kids and adults or maybe they could bring non-food trinkets for the kids. Reading labels for allergens and restrictions can be hard, especially if you aren’t familiar with the list of ingredients to look for. So as a safety precaution for both you and your guests, just save the label for them to look at. I know it gives me peace of mind to know what was used and if it is safe or not. One time, someone made us a treat and said it was nut-free, but after looking at one of packages, we saw that it contained ALMOND flour. Thank goodness we had a label to look at. Remember that special occasions are really about spending it with people you love. It really won’t matter if the table is perfect, or the place settings match. Goodness, my kids would rather us all use fancy paper plates and utensils just so make clean -up easier and there’s nothing wrong with that either. 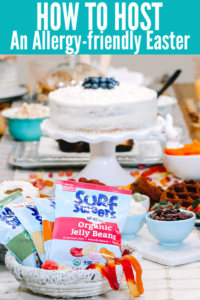 The biggest thing is to create memories and moments in a safe environment and with these recipes and some yummy allergy-friendly treats (thanks Surf Sweets), you can make an Allergy-friendly Easter to remember. Thank you to Wholesome for sponsoring this post and creating food products that are allergy-friendly, naturally vegan and gluten-free. 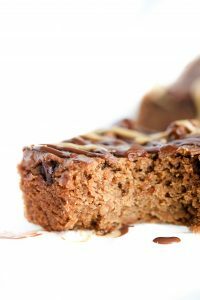 Every recipe on this post used Wholesome as the sweetener of choice and we’re loving these safe treats as well. To learn more about their products, click here. 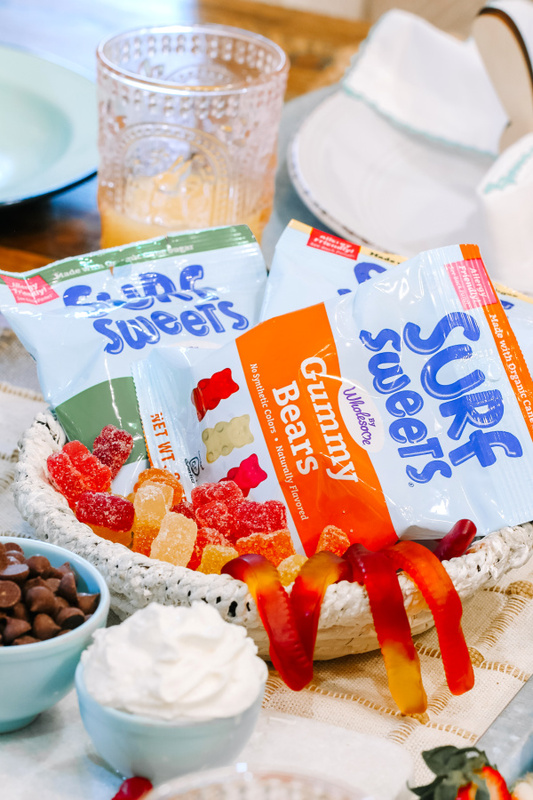 We also love surf sweets! But, I have to say, your blueberry muffins have my attention here, they look phenomenal. Your photos are always so enticing, Nicole. 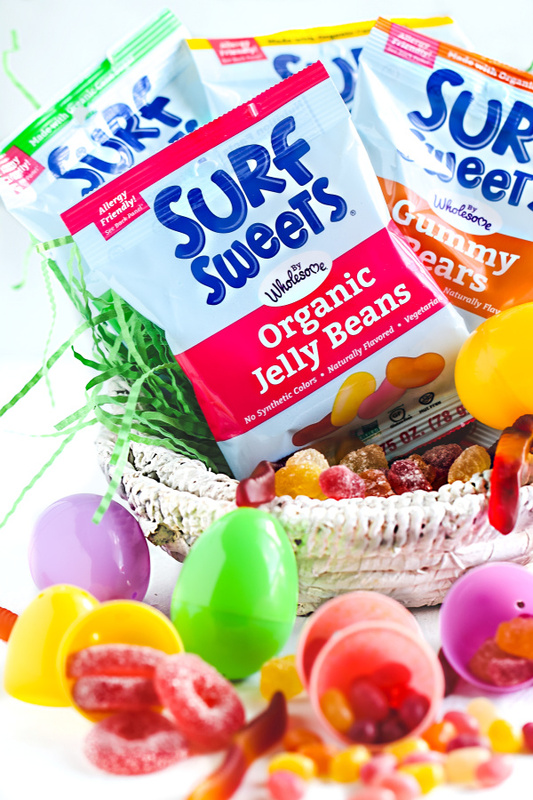 I love Surf Sweets! They’re so perfect for kiddos and adults with food allergies or just looking for a better for you candy! I agree! Surf Sweets is a great option for food allergies or for people like myself, who just prefers vegan candy. Can I come to your house for Easter? You put on such an amazing spread Nicole! Love the ideas, and the reminder to get some of those jelly beans! They are so good. You have such great ideas for a safe holiday! I love those gummy worms!